Sea, Sand & Sky: Find Your Treasure on Spectacle Island This September! Find Your Treasure on Spectacle Island This September! You've seen it in the summer, now experience the spectacle of Spectacle in the fall! 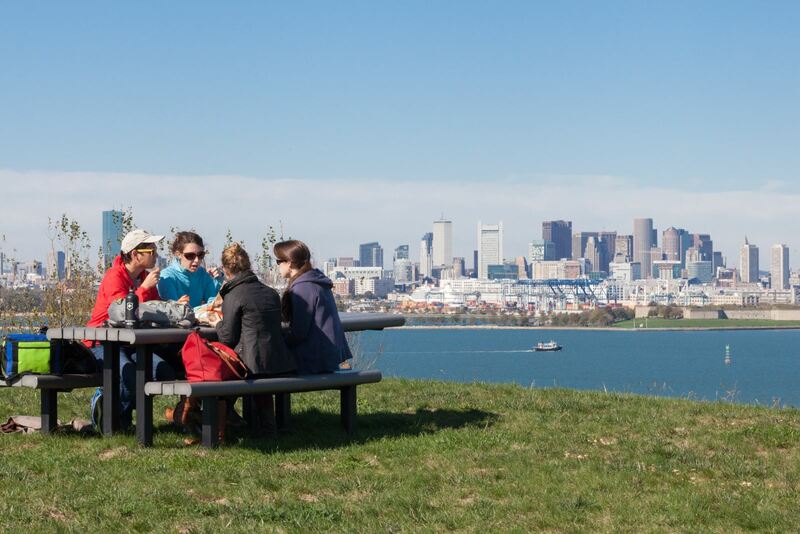 On Sunday, September 17th, Save the Harbor/Save the Bay will host the first of two free fall cruises to the Boston Harbor Islands National and State Park! 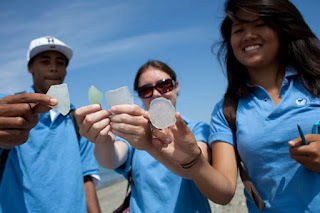 Join us this month for the Treasures of Spectacle Island cruise to hunt for sea glass and artifacts on Treasure Beach, hike the North Drumlin for a view of the city and the harbor, and fish with our Youth Environmental Education Program staff! We will begin boarding the Provincetown II at Bay State Cruise Company's dock at the World Trade Center in the Seaport at 9:30 AM for a 10 AM departure. The boat will depart the island at 1:30 PM for a 2 PM arrival back at the World Trade Center. The snack bar on Spectacle Island will be open, as well as the snack bar aboard the Provincetown II. You are also welcome to bring a picnic lunch! Please remember that the Boston Harbor Islands National and State Park has a "carry-on, carry-off" policy, so bring a bag for your trash to dispose of back on the boat. Reservations are required. Though there is plenty of room on the boat, space is still limited, so please RSVP via this Google Form. If you have any questions please contact Amy Gaylord via email at gaylord@savetheharbor.org or phone at 617-451-2860 x1008. Though as usual, any sea glass or artifacts found on the island must stay on the island for other visitors to enjoy, we do encourage you to find and keep the one inch blue frosted glass marbles that you find on the beach, as they are your ticket to enter the 6th Annual Simply Marble-ous Treasure Hunt for JetBlue Flights! Just post a picture of yourself with the marble to Save the Harbor's Facebook! Desperate to see Autumn in the Islands, but can't make it on September 17th? 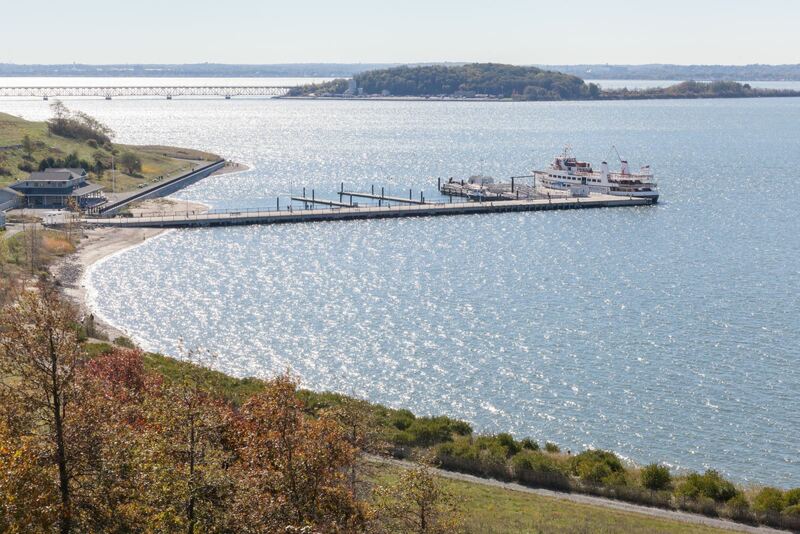 We cruise to Georges Island on October 14th - so mark your calendar! To learn more about Save the Harbor/Save the Bay and the programs we offer, like us on Facebook, and follow us on Twitter and Instagram @savetheharbor. Save the Harbor is grateful for Partnership Grants from Forrest Berkley & Marcie Tyre Berkley, Comcast, Eastern Salt Company, Inc., Fan Pier - The Fallon Company, John Hancock Financial Services, The Llewellyn Foundation, Massachusetts Bay Lines, Massachusetts Environmental Trust, Massachusetts Port Authority, National Grid Foundation, Nicholson Foundation, Lawrence J. and Anne Rubenstein Charitable Foundation, William E. & Bertha E. Schrafft Charitable Trust, Clinton H. & Wilma T. Shattuck Charitable Trust, Vertex, Yawkey Foundation. Save the Harbor also appreciates funding support from Arbella Insurance Foundation, Blue Hills Bank Foundation, Blue Hills Bank Pavilion, Boston Properties - Atlantic Wharf, Boston Properties – 200 Clarendon, Camp Harbor View Foundation, Clipper Ship Foundation, Cronin Group, LLC, The Daily Catch Seaport, Davis Family Foundation, Elizabeth Elser Doolittle Charitable Trust, Alice Willard Dorr Foundation, Emera Inc., Enbridge, The HYM Investment Group, LLC, Lovett-Woodsum Foundation, Massachusetts Convention Center Authority, Massachusetts Water Resources Authority, P&G Gillette, RMR Real Estate Services, Skanska, South Boston Community Development Foundation, Tishman Speyer. Save the Harbor would also like to thank our supporters 3A Marine Service, Andus Baker & Rowan Murphy Family Fund, The Bay State Federal Savings Charitable Foundation, Beacon Capital Partners, LLC, Boston Bruins Foundation, Andrew J. Calamare & Marianne Connolly, Circle Furniture, Kevin & Dee Colcord, Diversified Automotive, Tom & Lucinda Foley, Fort Point Framers, Goulston & Storrs, Legal Sea Foods, George Lewis - Haven Trust, Liberty Bay Credit Union, Mass Bay Credit Union, Massachusetts Marine Educational Trust, National Park Service, Randy Peeler & Kate Kellogg, Red Sox Foundation, Storm Duds, Matthew J. & Gilda F. Strazzula Foundation, TD Charitable Foundation, UDR, Kyle & Sara Warwick.